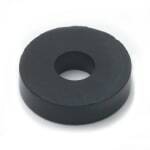 The T&S Brass 001092-45 seat washer is made for heavy duty and B-11000 faucets. The material the washer is made from is rubber. The small flat ring is fixed under a nut or bolt to evenly distribute the pressure when these parts are tightened. The inside diameter is 3⁄16 of an inch, with an outside diameter of 1⁄2-inch. The thickness of the washer is 1⁄8-inch. The T&S Brass 001092-45 seat washer is NSF 61 Section 9 and NSF 372 certified.